10.00 to 19.30 Monday to Friday, 10.00 to 20.00 Weekends and holidays (November to March). 10.00 to 20.00 Monday to Friday, 10.00 to 20.30 Weekends and Holidays (April, May and October). 10.00 to 21.00 (June to September). 10.00 to 21.30 (July, August and Easter Holidays). 10.00 to 20.30 (Christmas Holidays). Best on weekdays or early mornings. We are comparing Barcelona Aquarium Skip the Line Ticket Prices from leading ticket suppliers and Try to find you Cheap tickets prices on the market. The Barcelona Aquarium is one of the most impressive displays of diverse sea life in the word, apart from the ocean itself of course. Inside you can find a total of 35 aquariums containing over 11,000 sea creatures from 450 species. The highlight of a visit to the Barcelona Aquarium is taking a walk through their incredible Oceanarium. The 80-metre-long, clear glass tunnel makes you feel as if you are walking inside the deep blue ocean with morays, giltheads, eels, ocean sunfish, sharks and even more swimming by your side and overhead. Without taking up scuba diving this is the closest you’ll ever get to these magnificent animals. The aquarium is prepared for both local and international tourists and information plaques are displayed in at least 2 languages, including English. If the kids aren’t having enough fun already then stop by the on-site play area Planet Aqua or make a detour to see the penguins being fed. Fantastic for children and families or anyone with an interest in sea life. Inside the aquarium you can discover a variety of local and exotic sea creatures. This is a fun way for friends or individuals to spend a day in the city and a great way to learn about marine life. The attraction is suitable for guests of all ages and completely wheelchair accessible. Your Experience With Barcelona Aquarium Skip the Line Ticket? Make the most of your time on holiday with a skip the line entry ticket to one of Barcelona’s best attractions. Breeze to the front of the line with your entrance ticket and start exploring under the sea. See 14 habitats displaying species native to the Mediterranean and 7 hosting exotic fish from all across the globe, from the Red Sea to the Caribbean and the Great Barrier Reef. Feel like your swimming with the sharks and eels as you walk through the magical aqua tunnel. Take your time to explore and learn about all the interesting marine life that live in Barcelona’s Aquarium. Take your friends, travel companions or kids to marvel at the creatures inside this popular attraction or make a self-guided visit on you’re on your own. Choose the time and date of your preference to visit the world’s largest Mediterranean-themed aquarium. Keep reading for more details about the Aquarium. What Barcelona Aquarium Skip the Line Ticket Includes? Priority skip the line entry. This attraction will be very busy on weekends and bank holidays so we recommend visiting during the week or early in the morning. 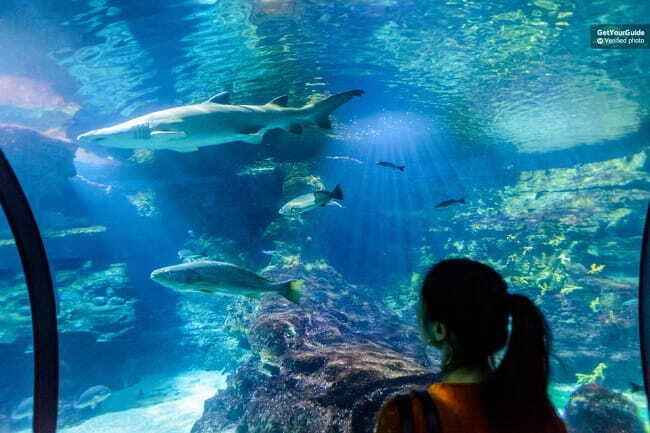 Travelers Reviews about Barcelona Aquarium Skip the Line Ticket? This attraction has a very positive 4.5 out of 5-star rating from Get Your Guide users. Over 500 people have also reviewed this attraction on Tiqets and given it 4.5-stars. Comments agree that the skip the line entry will save you a lot of time if visiting during busy periods. Reviews on Trip Advisor are not as positive, however, most complaints are regarding the length of the entrance queue so with the skip the line admission ticket you shouldn’t have any problems. Some reviewers also point out that the aquarium hosts an interesting range of sea life and had good information available in English. Instant booking confirmation will be provided. You will need to print your ticket and bring it to the aquarium entrance. Tickets may be refunded up to 24 hours in advance depending on your ticket provider. You may be required to make your cancellation sooner in order to avoid penalty charges. Please check your ticket providers cancelation policy, some tickets are non-refundable. Children are not permitted to visit without a responsible adult. Meeting Point: Entrance to the Barcelona Aquarium, Moll d'Espanya del Port Vell, Barcelona. Please go directly to the front of the queue/fast track entrance on arrival.